The fourth and final workshop took place in the Battleby Conference Centre, outside Perth, on 14th March. 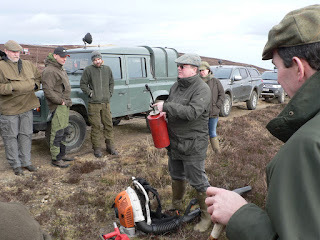 This workshop had a different feel to it as we did not include a visit to an area of moorland and used the time to discuss some of issues in more depth. We addressed a range of issues during the workshop. To set the scene, I provided the background to the review before handing over to Michael Bruce and Graham Sullivan who led discussion on: the Risk Assessment approach being adopted for the Code, Ecosystem Service and Environmental Issues, and Planning for Burning and Cutting. As for the earlier workshops, the focus was on getting the views of delegates on the issues and there was good discussion during the workshop. This has provided some useful feedback that will be incorporated into the review. The structure of the Code on the website could be in two layers - essential information could be highlighted in the first layer and further detail in the second layer. There was support for reducing the volume of the text. The proposed structure will not be used as an excuse for including more information than necessary. The proposal to use video clips to demonstrate activities was liked and a voice-over could be a good way to get information across. The status of the Additional Information will be clarified. Is it part of the Code or is it seen as providing ancillary information? The proposal to highlight the different categories of guidance as MUST, SHOULD, or COULD was supported. Once again, there was support for the concept of a guidance card to provide access to the information contained in the tables, but consideration should be to its presentation so that the information can be accessed easily. There is a need for training to allow practitioners to apply fire science principles to make burning safer and easier. The revised Code could be seen as a catalyst to the introduction of more formal training. Wildfire mitigation and muirburn should be seen as working together. The value of a fire danger rating system calibrated to Scottish fuel types was recognised; it would provide benefit for planning SFRS response and practitioners muirburn effort. A complete ban on burning on peatland could have unintended consequences. The report commissioned by the CarbonXchange from the James Hutton Institute will be published during March. This has assessed the science surrounding muirburn on peatland, and the findings from the report will be used to develop the Code. The value of adopting a risk assessment approach in the Code was recognised, for example to guide fire size or the number of people required to burn safely. A risk management approach is seen as a better way to assess the impact of muirburn on ecosystem services and environmental features. Fire size should be addressed in the Code in a way that allows different sizes of fires to be used to achieve different objectives. Buffer zones to protect waterbodies are seen as an important feature of the new Code and brings the muirburn code into line with the burning codes in other countries. Local knowledge is an important contributor to burning safely. The Code must give clear guidance about the activities that are right and those that are wrong. A revised Code is of no value until it is adopted by practitioners. Publication of the Code must be followed by promotion. The promotion of the Code needs to address ways to reach people who do not recognise the need to follow the guidance in the Code. There are some concerns about the tables included within the Code. Can these be simplified and presented in a better form? A checklist that is too detailed will remove the need for a practitioner to think about the issues. The Code should be presented in a way that practitioners will see as being positive, not negative.